Dear Mr. Loerke, this weekend you cleaned out our file cabinet, sold medical books you didn't need, and organized your desk. Praise the Great Lion of Judah. So impressed! Dear American Airlines, after 31 flights this year I'm excited to no longer have checked baggage fees. Thanks for the Priority Access. Dear Morgan Read, congrats on killing your first half, sweet friend! 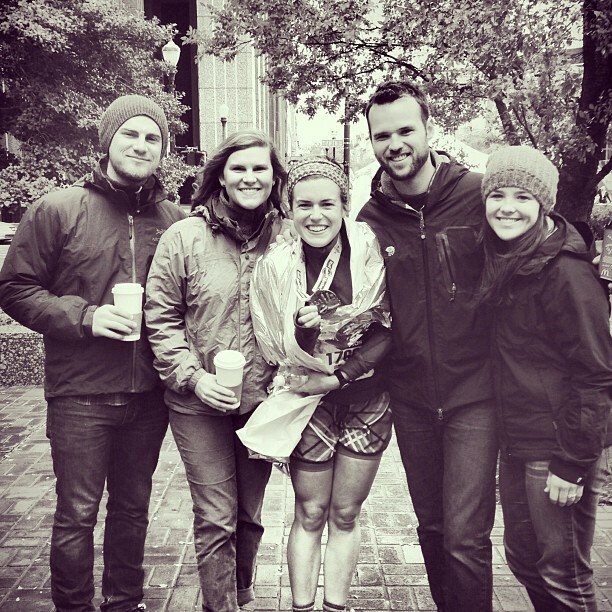 Watching you rock a foil cape after 13.1 was worth a plane ticket to Louisville. #PROUD. Dear Timothy James, one interview today and two tomorrow. Goonies never say die. Happy freaking Monday, friends! How was your weekend? Speaking of Goonies, what's your favorite 80's movie? Can't get enough of Breakfast Club, Ferris Bueller's Day Off, The Christmas Story, and ET. Can't believe you didn't mention Back to the Future! Definitely my fave. Goonies is pretty awesome too, but somehow, I never watched it until two or three years ago..., so it's missing the nostalgia factor for me. My sister would probably vote for either Sixteen Candles or Pretty in Pink (big Molly Ringwald fan...). Love me some Sixteen Candles! Favorite 80's movie....a toss up between Can't Buy Me Love and Lucas. Spent the weekend in bed with the sniffles. Congrats on the priority baggage. It's about time! Always love me some breakfast club and sixteen candles. The Christmas Story? A must have tradition over here with the Woods clan. HOW HAS NO ONE SAID DIRTY DANCING?!?! 80s or anything, that's my favorite ever! Ferris Bueller's Day Off. Favorite movie of any decade. Final answer.